April is finding her new job as a computer programmer to be tedious and pointless, and she’s not getting along with her boss. “I… I don’t know…” answers Splinter. April gets back to Robyn’s apartment after work and the sisters have another argument over the messy state of the dwelling. “You come here all screwed up from some weird relationship you can’t even talk about… I open my house to you, give you a shoulder to cry on and all you do is criticize me and my life?! !” Robyn exclaims. “I heard what you said… and I’m sick of hearing it! Mom’s dead… and you’re not Dad!” with this Robyn storms out of the room. “I… cannot…” Splinter decides as he lets the creature go. “To deny the inner beast… means your death.” Rat King tells him. “Better then… to die…” concludes the Master. The Foot blow up the floor of the tower and the TMNT fall through to the rooftop below. 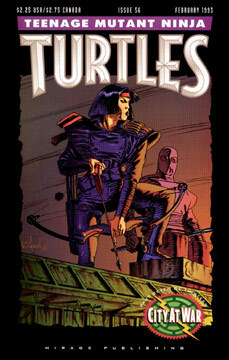 A fight ensues, the Turtles facing off against Karai’s Foot Soldiers.